You are vary good, you should see some of my art work and tell me what you think. Nice piece and kudos to spirit on the neat keyblade designs. but um...can you change the description? 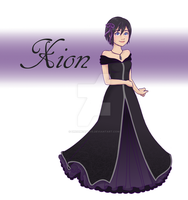 I was the original creator of this Xion design (you can check here: [link] ) and I let use the design for his story... Sorry if I sound like a bother..
but still this is amazing and lovely artwork!! Thank you ^^ I'm just always worried that I bother people when I point out stuff like this. and like I said before this really is lovely artwork! KH and Naruto fans unite!